The obverse of this medal bears the diademed head of Queen Vctoria with the inscription 'VICTORIA REGINA' and the date 1854. The reverse shows a winged figure of Victory crowning a Roman soldier, who is holding a shield in his left hand and a sword in his right, with a laurel wreath. The word 'CRIMEA' can be seen to the left while the designer's name of Wyon is visible in tiny letters to the lower right. The medal is fitted with a foliated swivelling suspender unique to this medal and sweated to the medal. Only a maximum of four clasps could be awarded to any one person. The clasp Azoff was awarded to the Royal Navy only. The clasp Sebastopol was automatically awarded to those qualifying for either the Balaklava or Inkerman clasps. As with the suspender, the design of clasp is unique to this medal with oak leaves and acorns. Watered 1" wide light blue with narrow yellow edges. The colours are the reverse to that of the Baltic Medal. Because of Queen Victoria's wish to have these medals issued to her soldiers as quickly as possible they were awarded unnamed but could be returned for official naming later. Those that are officially named are impressed in the same style as the Military General Service Medal, however most where either regimentally impressed or privately engraved as few soldiers wanted to send back their highly prized medals for naming. Many different styles are therefore encountered and care should be taken to determine if these are contemporary. Collectors frequently encounter many unnamed examples. Those officially named normally command higher prices but privately (even sometimes crudely) named medals should not necessarily be refused by collectors. However extreme caution should be exercised when encountering medals named to officers and men who took part in the charge of the Light Brigade at Balaklava and should be verified before purchase. In 1970's some unnamed examples were falsely (but convincingly) named to such recipients. 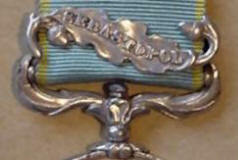 Retire to the page pertaining to Crimea War Medal recipient. . .